Valentine’s Day is almost here and if you are still looking for a cute gift that is pretty simple to make look no further. I remember making these one year when I was growing up and they couldn’t be easier. So this year I decided to have my 5 year old help me make one for her teacher for Valentine’s Day. There are so many variations for this craft so change it up to fit your needs. 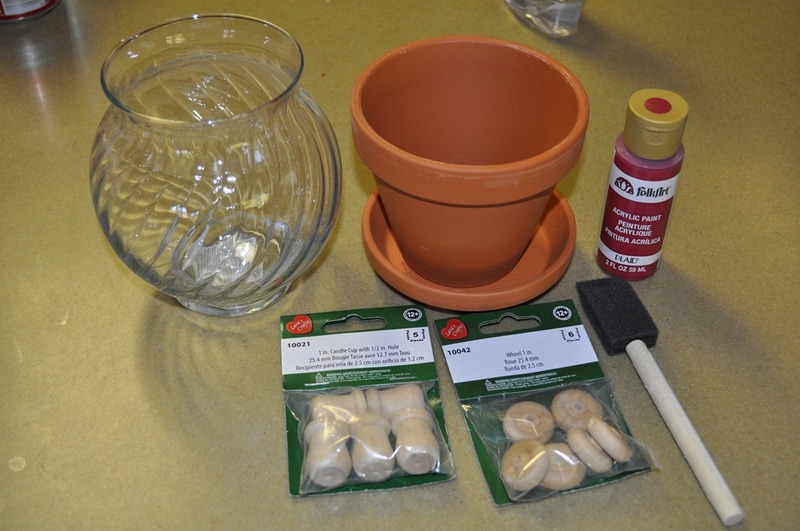 What you need to make this is a terracotta pot and saucer, glass candle holder, wood knob for the top, wood wheel for the front, paint, and paint brush. I have been able to pick all of this up at the local walmart so don’t be worried about finding what you need. I have also used the candle holders with the scalloped tops and they work just fine, this time I decided to try something different. 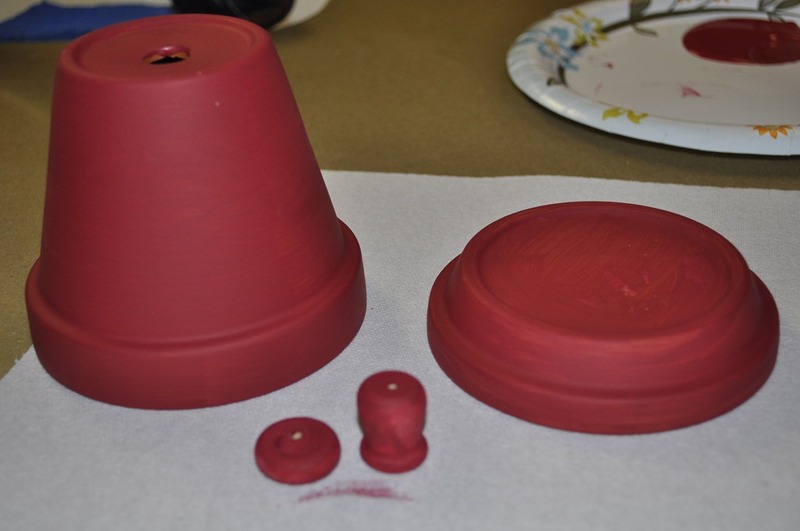 Once you get all your supplies paint the pot, saucer, knob, and wheel all the color of your choice. I picked red because it went with Valentine’s Day and because it reminds me of the red gumball machines. Make sure you give the paint plenty of time to dry. Mine sat for a couple of hours. Then you need to glue the knob to the bottom of the saucer to make the lid. Then flip the pot upside down and glue the candle holder to the top of that. Finally glue the wheel to the front to look like the place where the gumball drops out once you pay your money. Now in the past I have used hot glue to glue this together and for some reason it just doesn’t stick well. So this time I used Weldbond and it seems to have done the job. What ever glue you use make sure that it has time to dry. 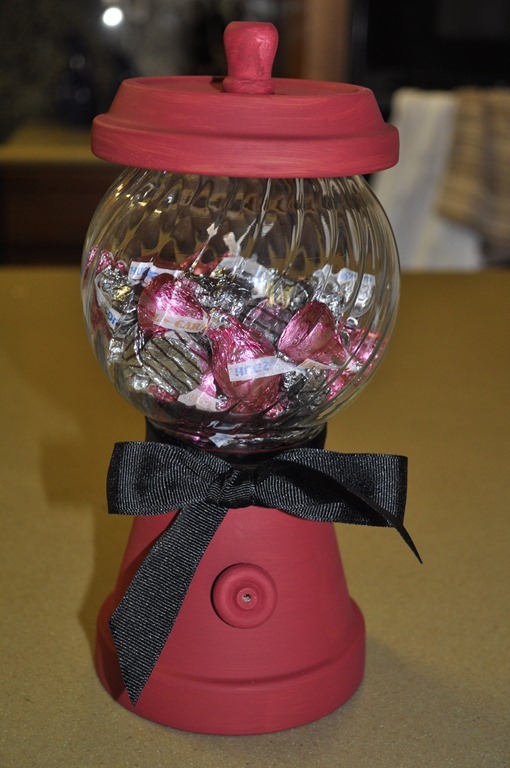 Once everything is dry fill it with candy and tie a ribbon around the middle. 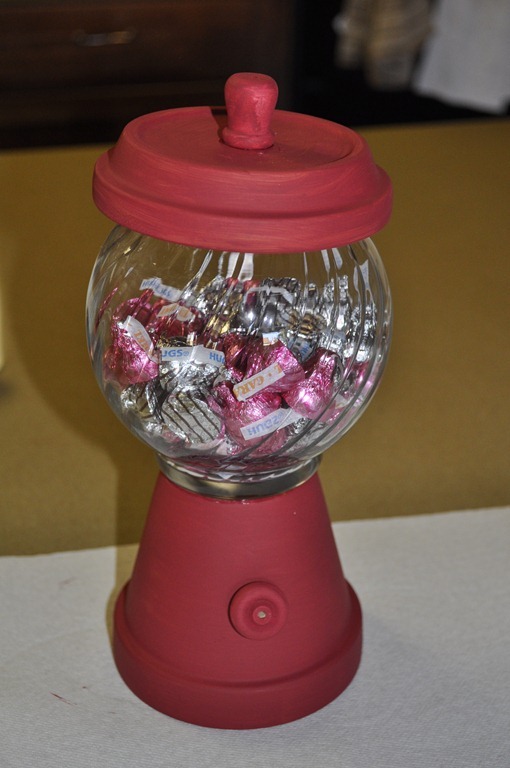 We filled ours with Hershey Hugs and Kisses again to go along with the Valentine’s theme. Hope you have fun crafting and have an extra special Valentine’s Day. Happy World Nutella Day! Today is the day to enjoy the goodness of Nutella. Since it is World Nutella day I think that everyone has an excuses to eat Nutella for Breakfast, Lunch, and Dinner. Nutella is such a wonderful treat in our house and if you are looking for a great recipe check out a couple of my favorites below. Enjoy World Nutella Day! So in my house we eat a lot of chicken. I really don’t have a reason for why we do, seems that everyone likes it and doesn’t cry or complain to much when I serve it. I especially like to find good chicken recipes that I can make extra and then use it on top of my salad for the next few days. This turned out to be one of those recipes. It was really simple to make and I pretty much always have the ingredients in my house so extra bonus not to mention the kids ate it! I hope it is a hit in your house to. 1. Preheat oven to 500 degrees and lightly grease a casserole dish. 2. In a small saute pan, saute garlic with olive oil until tender. 4. Place chicken breasts in prepared baking dish and cover with the garlic and brown sugar mixture. 6. Bake uncovered for 15-30 minutes or until juices run clear. The super bowl is only a day away and if you are looking for some great recipes to serve while you watch the game look no further. Most of these are super easy to make and will please any crowd.